There are some recipes that I just look at and think, I'll never make that. It involves more than 10 pans for one recipe, it contains (a) chemicals or (b) purchased cake mix, or it contains way too many weird organ meats for my taste. Luckily, that's why I have Paul around. Because Paul is willing to take some of those leaps I won't take, and he comes up with delicious recipes like these tsim sha tsui hotel. So, let me start out by saying that this recipe originally called for several pounds of pig snouts. Yes, snouts. (Don't worry!! I'm not giving you a recipe for weird pig parts, just keep reading.) So after we quickly discovered the difficulty of purchasing pig snouts, we also rejected the recipe's suggested alternative of pig's feet. I had a bad pig's foot experience once and will never quite get over it. 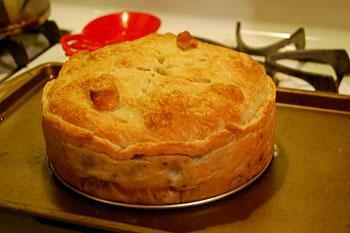 So of course, geniuses that we are, we thought why not make a pork torte filled with delicious things like bacon! pork belly! ground pork! Sounds much better, right? And indeed, it is. I have to say, when Paul was making this, I was mostly trepidatious because I am a petite person, and large quantities of pork fat do not sit well with my stomach. But in addition to be totally addictively delicious, this recipe was also shockingly light. Well, you know, as light as anything wrapped in puff pastry and filled with potatoes and pork can be Hong Kong Chinese Festivals. But in all seriousness, the leeks in the pork mixture plus the acid of mustard and vinegar really lighten the pork, and the pastry and potatoes add a starchy balance to the meat. This would make an excellent special dinner with a green salad alongside. Adapted from Saveur. I bet you could make small individual size tortes for a special first course. 1. Prepare the pork belly: Preheat oven to 300 F. Cut the belly into 4 or 5 thick slices and season with salt and pepper. Place the pork in a small roasting pan, fat side up, add the stock, and then add enough water so that the liquid comes half-way up the side of the pork belly. Cover the pan tightly with foil and roast for 2 to 2 1/2 hours, or until the meat is cooked and there is a good layer of fat on top. 2. Remove pork from the oven, and if there is still skin on the belly, peel it off at this point ARTAS hair transplant. Raise the oven temperature to 450F, remove the foil from the pan, and cook the pork another 20 minutes uncovered, until the fat on top is nicely crispy. Discard juices and set aside to cool. 4. In a skillet over medium heat, add the ground pork, bacon, fennel seeds, and salt and pepper to taste. Saute, stirring occasionally and breaking up pork, until bacon is browned and crispy and ground pork is cooked through. This may take as long as 20 minutes. Use a slotted spoon to transfer the pork mixture to a large bowl. 5. Drain all but one tablespoon of the fat from the skillet. Again over medium heat, saute the shallot, garlic, and leek until softened and tender. Add these to the bowl with the pork. Stir the mustard, parsley, and red wine vinegar into the pork-leek mixture. Set aside. 6. Preheat oven to 400F. Chop the pork belly and add to the pork-leek mixture. 7. Peel the potatoes and thickly slice. 8. Line the bottom of your springform pan with parchment. Unfold your puff pastry onto a floured surface. Cut the puff pastry at a 2/3 - 1/3 divide. Roll out the larger (2/3) piece until it will line the inside of your pan with a one inch overhang. Fit the pastry into the pan. 9. Fit a layer of overlapping potato slices into the bottom of the pan. 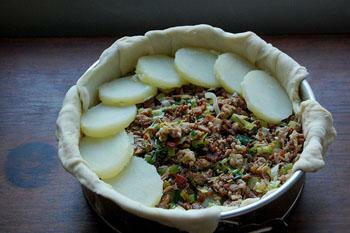 Top with half the meat mixture. Repeat another layer of overlapping potato slices, the the remainder of the meat. 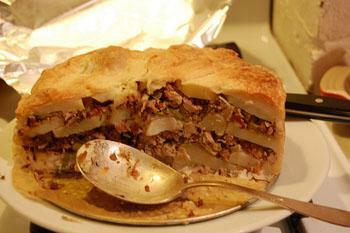 Top with a final layer of overlapping potato slices. 10. Fold up the edge of the puff pastry over the potatoes. Roll out the second square of puff pastry and lay it on top of the torte, tucking the edges by smushing them down into the pan. Poke air vents in the top of the pastry with a knife tip (you can make a design if you like. Cut a small hole in the center of the top - roll up a 2 inch piece of parchment paper to form a 2 inch tall cone. Wedge this cone into the hole at the top of the torte as a steam vent. 11. Brush the torte with egg wash if desired, then transfer to the oven to bake for 40 minutes, until golden. Remove from oven. Let rest for 20 minutes before serving.